Most gardeners welcome bees to the landscape, as many bee-pollinated ornamental and agricultural plants would fail to survive without the assistance of helpful bees. Bees are unwelcome visitors, however, for people who have allergies, as bee stings can have serious life-threatening consequences. Although it's impossible to keep your garden completely free of bees, certain plants are pollinated by other means and will discourage bees from visiting your yard. Feverfew (Tanacetum parthenium) is a necessity for any bee-repellent garden. Although feverfew, related to the chrysanthemum, is an attractive and virtually maintenance-free plant, the taste and smell are so bitter that bees will avoid the entire area. To repel bees, plant fevervew at strategic spots in your garden or in containers on your patio or near your front door. Feverfew will grow in full sunlight and any well-drained soil. In most climates, the plant will reseed from year to year. Magnolia (Magnolia grandiflora) blooms without benefit of bees, as the old southern favorite is pollinated solely by beetles and other crawling insects. 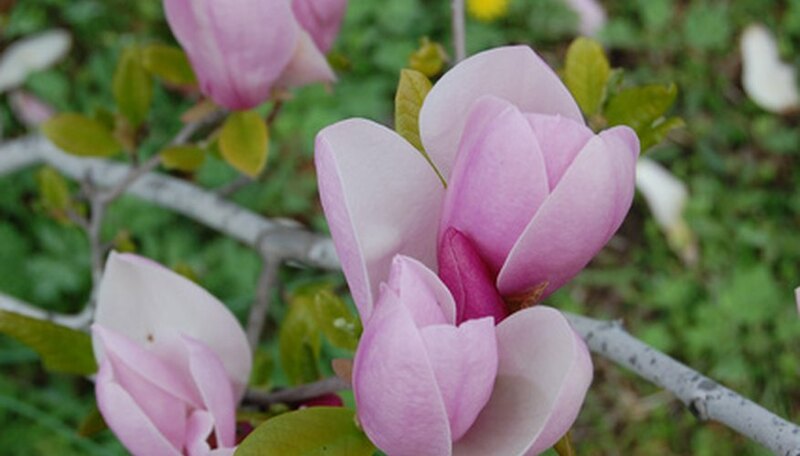 A versatile shrub, magnolia is available in a range of colors including pink, yellow, green, purple and white. Magnolias do best in full or partial sunlight and moist, well-drained soil. Most magnolias are hardy to USDA Zone 8. Trumpet honeysuckle (Lonicera sempervirens) us a good choice for a bee-free garden, as the plant's spring-blooming, trumpet-shaped red blooms are pollinated by birds. Plant trumpet honeysuckle in a sunny location where the vines can be supported by a fence, trellis or wall. Trumpet honeysuckle is hardy to USDA Zones 6-8. In spite of its evergreen foliage and charming blooms that add color to the landscape in late summer and early autumn, Japanese anemone has a tough constitution and will thrive in poor soil conditions and neglect. Japanese anemone, unattractive to bees, prefers well-drained, moist soil, either sunlight or partial shade and is hardy in USDA Zones 4-8.